 There are 12 alerts for this place. The largest regional park managed by Auckland Council, this park covers 17000 hectares of rich and diverse forests, as well as the dramatic and beautiful coastline from Muriwai to Whatipu. 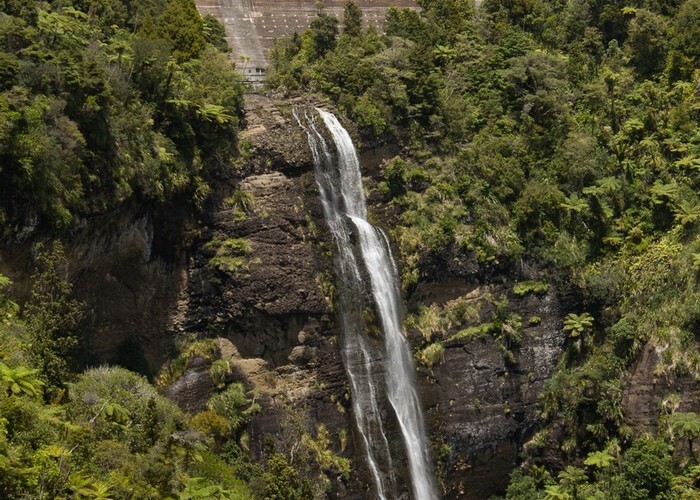 Waitakere Dam and Falls • By Matthew. 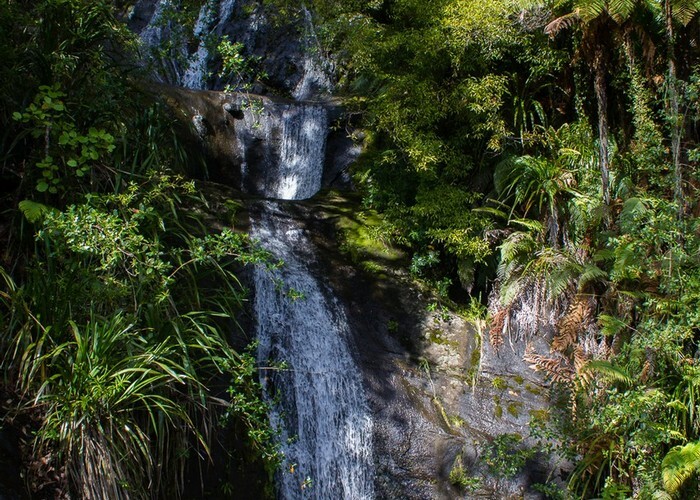 Licence: C.
The park is an aggregate of a number of different reserves that have been accumulated over the years, and is divided into several management areas including: Anawhata, Cascade Kauri, Cornwallis, Huia, Karekare, Piha, Te Henga - Bethells, and Whatipu. Upper falls, Fairy Falls • By Matthew. Licence: C.
A rich network of tracks explore the low ranges, with quite a number of highly maintained tracks available, alongside more rugged (and generally muddy) options. As the park forms much of the water supply catchment for Auckland City, there are a number of reservoirs, dams, and tramways that may be explored, although access to the water in the reservoirs is prohibited. Geologically, the ranges are the remnants of a offshore volcano. 16 million years ago, the massive Waitakere Volcano lay 20km offshore. Today, the steep cliffs at the edge of the park are the remnants of the eastern slopes of this volcano, formed largely of Manukau breccia. However, the black sand beaches come from elsewhere: titanomagnetite swept up the coast from Taranaki. Get your bearings at the Arataki Visitor Centre, and gain an introduction to the local flora on the Arataki Nature Trail. 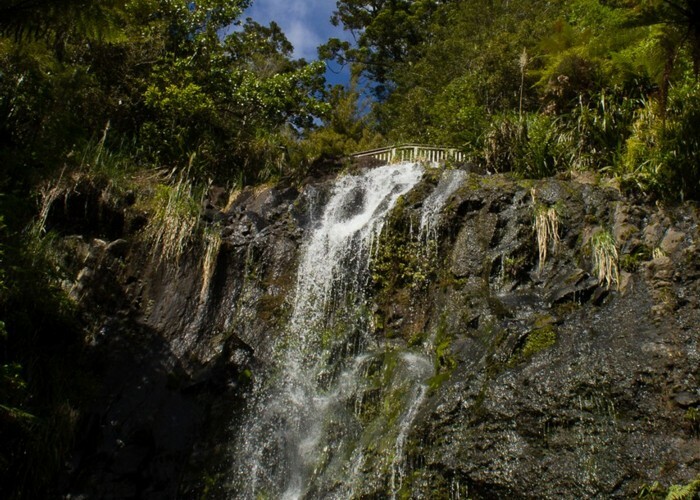 Explore the beautiful Fairy Falls Track or Kitekite Falls. The Hillary Trail is a challenging 4-6 day walk following the coastline. Take the 4-hour Montana Heritage Trail circuit. Explore the wild blacksand beaches of Whatipu, Piha, or Karekare. Visit the Muriwai Beach Gannet Colony. The Waitakeres are under an hour from central Auckland. To get to Huia or Whatipu, take Titirangi Road from New Lynn. Then turn onto Huia Road at the roundabout. To get to Karekare or Piha, take SH16 and turn left at Te Atatu Road. Public transport goes only as far as Titirangi. From here, walk along Exhibition Drive and the Beveridge Track to Arataki Visitor Centre. Fairy Falls • By Matthew. Licence: C.
Motor camps are located in Muriwai and Piha. A variety of bookable drive-in and walk-in campgrounds are found throughout the park. Entrance fee: there are no fees for access to the park. Pets: dogs are allowed on lead in some areas. Further information. Vehicles: the following tracks are suitable for mountain bikes: Pipeline Track, Beveridge Track, Exhibition Drive, Upper Nihotupu Dam Walk. Overnight camping and walking: bookings and fees are required for overnight camping at established campsites. Some areas are closed due to Kauri Dieback. Please respect signage and use cleaning equipment provided. Kauri Dieback is a serious problem in the park and the subject of ongoing research. It is now known to be caused by the Phytophthora water mould, which appears to be an exotic species. In order to manage impact, some tracks have been closed. Footwear cleaning stations have been installed at track ends: please disinfect and clean your footwear. In order to avoid spreading this disease, please keep to tracks and standard routes. 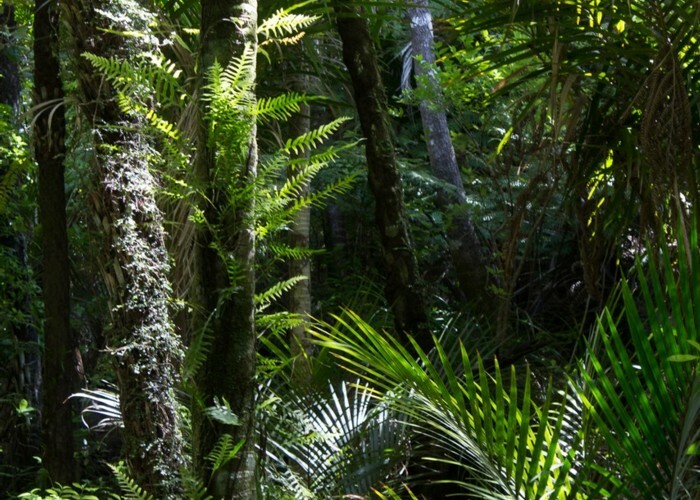 Nikau forest • By Matthew. Licence: C.
Added 30 November 2007 by MatthewMatthew. 8 revisions, most recently 11 December 2017 by MatthewMatthew. 308 views in the past year (26 per month).